Modern wall stickers are the latest trend in interior design, due to their ease of use and amazing results. 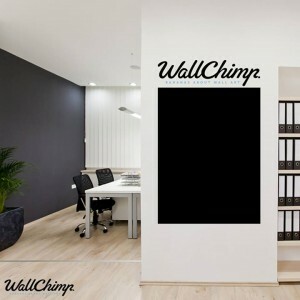 Wall Chimp use only the highest grade, premium blackboard vinyl on all of its stunning designs. These beautiful PVC, self-adhesive blackboards are easy to apply and remove without the mess of painting your own blackboard onto your wall, leaving no residue after removal. Washable and re-usable means that you can use any chalk you want on your board and can even be scrubbed by a wet towel. Great for adding memo’s and reminders in a unique and stylish way for every office and business environment.